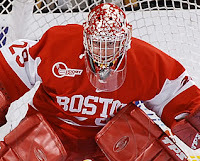 Karson Gillespie returned to the Terrier lineup Friday night, following a two-month layoff due to a high ankle sprain, and turned in his best effort of the season, blanking Providence, 2-0, as BU locked up the second seed in the Hockey East Tournament. The senior netminder from Saskatchewan stopped 33 shots including 15 in the final period to record his third career shutout. Two seasons ago, Gillespie shut out defending NCAA champion Denver, 1-0. Last year, he blanked Dartmouth, 3-0. A link to video highlights of Gillespie’s heroics and goals by freshmen Joe Pereira and Nick Bonino can be found here. BU’s quarter-final round opponent in the Hockey East playoffs is UMass-Lowell with the best-of-three series beginning at Agganis Arena on Friday, March 14 with a 7:30 p.m. game that will be broadcast on NESN. The Terriers took two of three games from the Rivehawks during the regular season. Kevin Gilroy had a hot hand for the South Shore Kings in their EJHL semifinal series against Jersey, but couldn't prevent the Hitmen from sweeping two games. The right wing, who was 2nd in the league in regular season goal-scoring, registered his 35th goal on Saturday in a 4-2 loss and a hattrick today as the Kings were eliminated, 5-3. Gilroy finishes with a combined 38 goals in 45 regular season games and four playoff games. BU's newest recruit, Ryan Ruikka ,wasn’t in the lineup for Jersey, probably due to an injury since he played 41 of 45 regular season games and played in the league all-star game. Corey Trivino and Ethan Werek each had an assist as Stouffville drew first blood in its conference final series with Aurora, but the duo was held scores when Aurora won the second game today. Kieran Millan's post-season winning streak ended at three when Grand Prairie took the first two games from Spruce Grove in the second round of AJHL playoffs. Sunday night's game was a 3-2 overtime loss in which Millan stopped 29 of 32 shots. Spruce Grove has yet to beat Grand Prairie this season.